This section is from the book "Airplane Photography", by Herbert E. Ives. Also available from Amazon: Airplane photography. 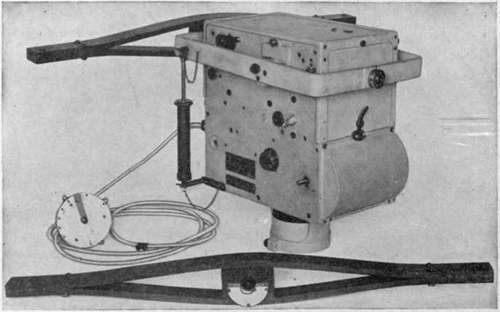 The Brock Film Camera (Fig. 60) is an entirely automatic, very compact self-contained camera, taking one hundred 4X5 inch pictures. The motive power is clockwork, regulated in speed by an escapement controlled by a flexible shaft carried to a dial which may be fastened to the instrument board or to some other convenient part of the plane. The lens is 6, 12, or 18 inch focus. The shutter is of the fixed-aperture variable-tension type, of long travel, and with a flap behind the lens for covering during the setting period. None of the special means above described for holding the film flat are provided. A metal plate resting on the back, and a flat metal frame in front with a 4 X5 inch aperture, are considered sufficient check on the excursions of the small-sized film. A ball bearing double pivoted frame serves to support the camera in a pendulous manner, permitting it to assume a vertical position after tilting. Damping of oscillations and vibration is arranged for by two pneumatic dash pots. Fig. 60. - Brock automatic film camera.